When the MTA Metro-North Railroad decided to produce a new advertising brochure to highlight their Group Travel Program they needed to determine locations to feature in the brochure. After making a special visit to the Lincoln Depot Museum this past spring, they knew the museum was an obvious choice. The criteria was simple. The location needed to be within a close proximity to one of their stations and it had to be a unique and quality attraction. The Lincoln Depot Museum satisfied both criteria and had the added benefit of being next to quality restaurants and the beautiful Peekskill Riverfront Green. Groups travelling to the museum could plan an entire day around the area. 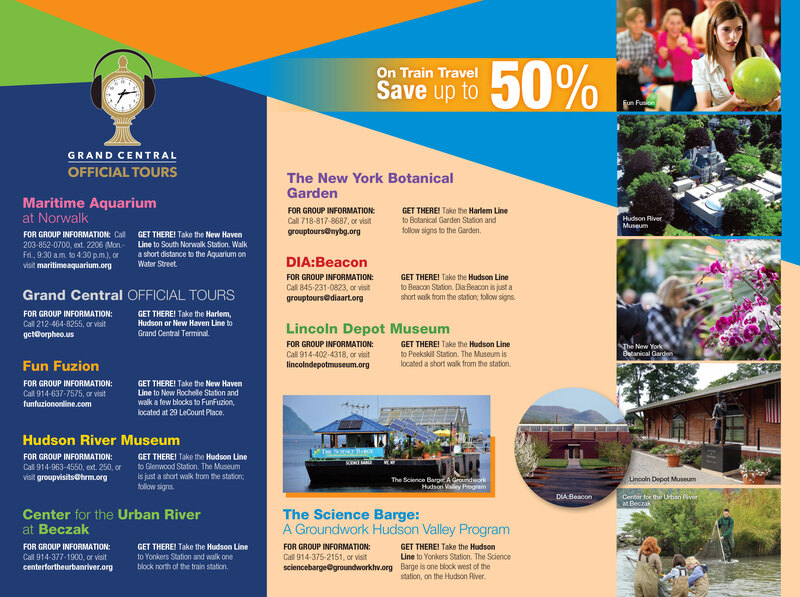 The Lincoln Depot Museum thanks the MTA for including us in the brochure and recognizing the museum as a “Fun & Exciting Destination.” We look forward to welcoming those groups taking advantage of the MTA Group Travel rates. Private group tours of the museum can be scheduled throughout the week and all year round.